Weight room sessions for the Hill-Murray boys hockey team will have long since ended, and the school’s parking lot will be all but empty, yet Bill Lechner typically still will hear music blaring and the telltale iron-on-iron clanging from the room next to his office at the school. 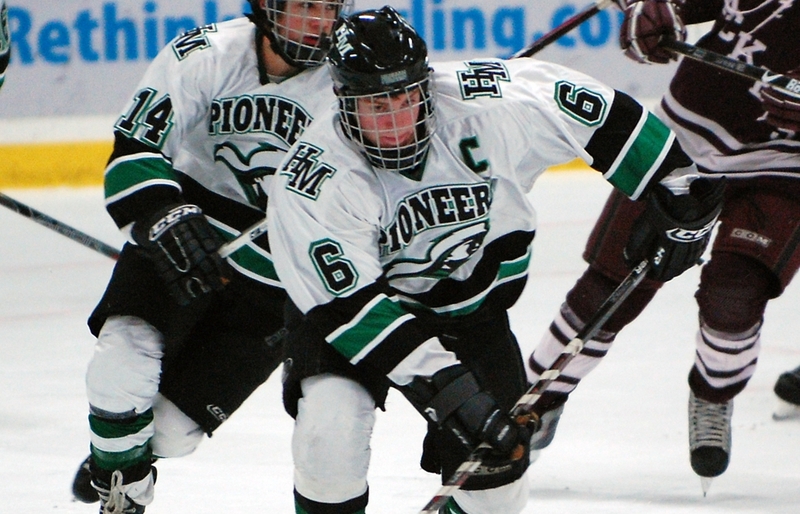 During the rare moments when Chris Casto isn’t working out, the senior can be found manning the blue line for the Pioneers, the state’s fourth-ranked Class AA team. He also budgets enough study time in his day to maintain a 3.6 grade-point average and, more recently, shop for colleges. A Friday trip to Duluth to watch the UMD hockey team was followed by another visit to the school on Tuesday, and that evening Casto made a verbal commitment to accept a scholarship offer to play for the Bulldogs. Typical. Casto’s coal-furnace intensity when it comes to hockey never diminishes, not even now, after locking up his immediate future with a commitment to one of nation’s top programs. A multi-sport athlete growing up, Casto eventually stopped playing lacrosse, baseball and football to devote all his time and energy to hockey. He spent most of his waking hours last summer honing his skills and chiseling his body at the Flexx Hockey Institute of Training at the St. Thomas Ice Arena in Mendota Heights. “He’s always been a decent player, and I think the work ethic and wanting to get better has elevated his game and his exposure,” said Mike Casto, Chris’ father. Lechner hesitated to call Casto an overachiever, pointing out that the rugged defenseman stands 6-foot-1 and weighs in at over 205 pounds. Casto was a sophomore on the Hill-Murray team that won the state Class AA title, and was a regular last season on the Pioneers’ state tournament team. Through 13 games this season he ranks fifth on the team in scoring with 12 points on four goals and eight assists. This fall, Casto was a standout in the Upper Midwest High School Elite League. He was selected to play in the league’s season-ending tournament, and as part of the championship Minnesota Red team, he lined up with – as it turns out – future college teammates in fellow UMD recruits Caleb Herbert of Bloomington Jefferson, Adam Krause of Hermantown and Justin Crandall of St. Thomas Academy. For the immediate future, not much figures to change. Lechner still will have to chase Casto out of the weight room so he can lock up and go home, and Casto still will select his trademark plain white T-shirt – “I’m going to have to buy him a T-shirt,” Lechner said -- as his workout attire.